It was a normal day at Bijra High School, Ratnadeep ( rtnpro ), Bappi and Harsh went there with their notebooks all running on Fedora 10. It was the previous day’s fiasco in Std. V that made rtnpro think that the kids need to enjoy the computers and then start learning the boring theory. So, he talked with Subhodip Biswas and decided to go to Bijra High School with notebooks, to make the classes more interactive. As expected, when they went to Std. VII, they all jumped up to their feet to see the DGPLUG guys opening our notebooks infront of them. Bappi and rtnpro showed them how to start the computer, how to login, explained the username-password relation with lock-and-key analogy. Then Rangeen Basu Roy Chowdhury and Shreyank Gupta from NIT Durgapur arrived at Bijra High School. Then the class was continued. Bappi and Ratnadeep ( rtnpro) showed the kids some cool KDEedu applications like Marble, Kbruch, played Videos, Songs, pictures, showed the kids themselves on the Laptop screen with Cheese. In between, Harsh was so frustrated that he was dying to teach apart from taking pics. Lucky, for him he found that the kids understood Hindi and he right away dived in to interact with the kids. We did it in groups. They were all elated. Then they were taken to the lab in two groups. There Bappi, Rangeen and Shreyank took charge. Shreyank also mended the mouse-cut wires of the speakers, and made them functional. 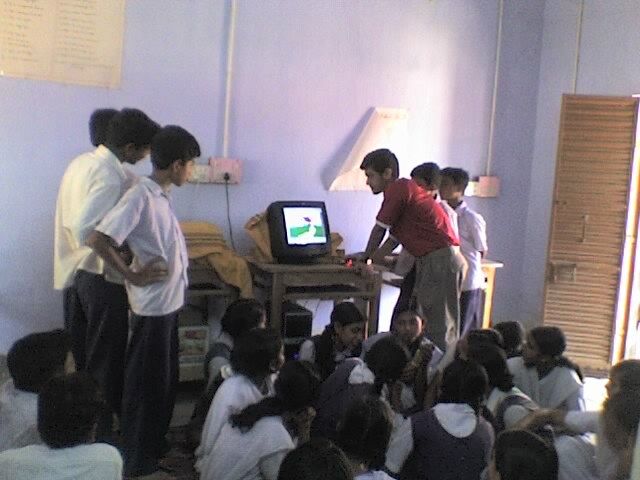 He started showing to the students some cool Nat-Geo videos, while others were on the other comuters with Bappi and Rangeen trying their hands on TuxPaint. Meanwhile, Ratnadeep and Harsh went to Std. VI with our notebooks. It was kind of the same response as we received in Std. VII. As in Std. VII, we showed them how to start a computer and do login. We also showed some cool applications like Marble, Kbruch, videos, music and pics. They were all enjoying the class. They now seemed really serious in learning this computer subject. It was around 3 PM that we wrapped up the classes. We introduced Rangeen and Shryank to Nizam Sir, the HeadMaster at Bijra High School. Then we got the 3:15 PM bus to Durgapur. Thus a normal day at Bijra turned out to be a great successful day for both us and the students of Bijra. 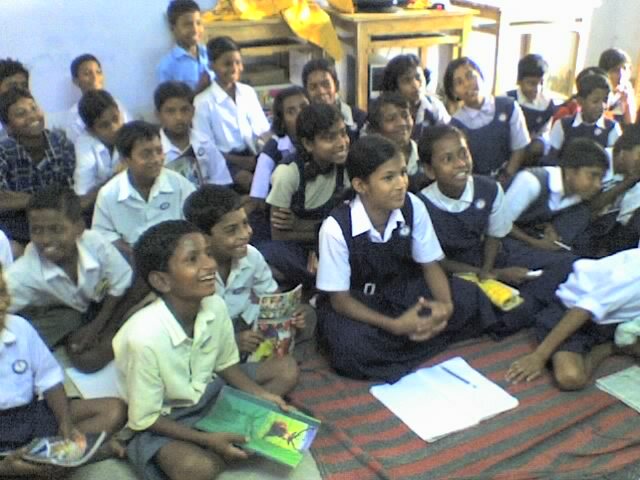 It was 16th February when Meejanur and Ratnadip went to take the classes at Bijra High School. As in the previous week the other members of the team already visited there and took classes of V. Already they have taught them the basics about computer, means what is keyboard, monitor, mouse etc. 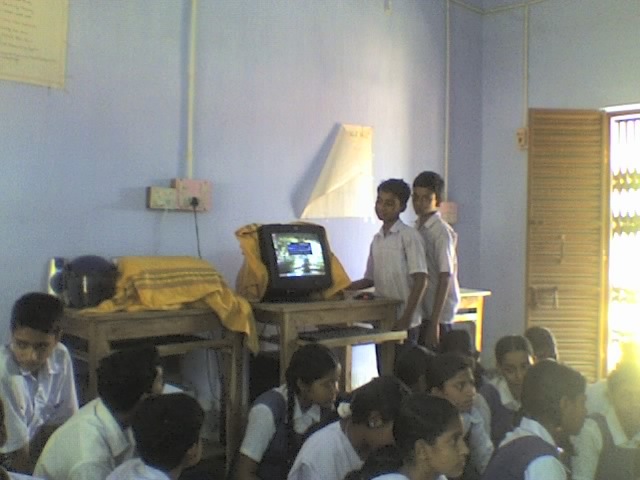 The students at least got an clear picture about what computer is from the previous class. So Meejanur and Ratna planned to take classes of class VII and VIII and the practical class of class V. But they reached there a little late bacause of the bad communication system. However they reached at around 11:30.They ,at first took the practical class of V. As the number of students of one class was more than 70 so they had to devide the entire class in two part because of the lack of computer there. They switched the computer on and then took the practical classes of of V-A section. Within this half portion they again devide them in parts of boys and girls.Ratna took the the responsibility of making one group understand and Meejanur took the other. They showed them the components of computer as taught in the previous class. Some students grasped it at the moment, some created disturbance for lack of their English knowledge, as some of them didn’t know meaning of left and right. Then the students were told how to type. They were then asked to write their own names. After this tasked been finished they were shown some basics tools. To make computer as a funny enjoyable thing it was planned to show them the thing of their interest. And from the students they came to know that they all all enjoys playing in drawing. So the two teachers(Ratnadeep and Meejanur) show them “paint”. They showed the basics of this tool as they learnt it fast as they were already interested on it. However after it was shown to them, the two’s told them to implement the thing by their own. At first some of them were even fearing of touching the mouse[:)]. But they learnt to do it and they enjoyed it very much. They both also distributed some chocolate among the best performers which might build them more interest. After this their break started and they went. After the break for the lack of time Ratna went to take the class of VIII and Meejanur took the V-B section’s practical class. In the class VIII Ratna taught them the basics and some of them knew the basics which was helpful for making them understandable. However these two classes ware taken on that day. Bijra High project finally started with a good thrust. After a grand inauguration which created all the buzz. there were quit a number of news media covering bijra high school project . Some of them are . Bijra High School Final Prep! At last final preps are over , on 14 th we are having the delivery of 5 machines from WBUT . On 15 th a inauguration will be held where chief guest will be Vice chancellor of WBUT , Prof Ashok Ranjan Thakur . Along with other administrative officials of the city. At last we had computers ready to be hand over to Bijra High School. For we had 21 days of our July and August dedicated to preparing and testing Bijra High School’s computers. 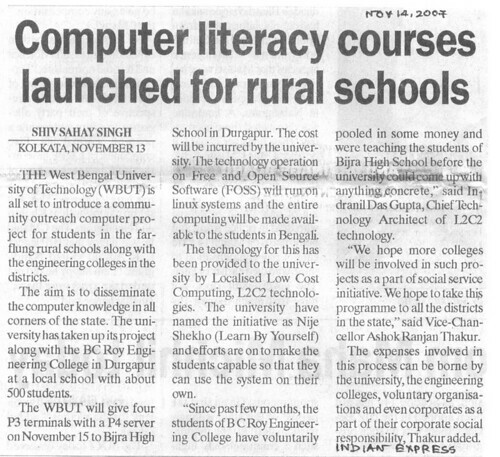 WBUT ( West Bengal University of Technology ) had promised us to donate 5 Computers including a server ,so that Bijra dont get deprived of facilities . In the 21 days and also few of our previous weekends we.the members of dgplug and students of BCREC had intensive training regarding implementation and testing of LTSP under Indranil Das Gupta. Our clients were 3 Dell Optiplex GX110 PIII machines with 128 MB of RAM and one IBM NetVista 6647. In our training course we tested Local Audio, Local Device access like USB Drive, FDD and CDROM. Some thing that were of real interest is FL_Teacher Tool which allow a instructor to have complete control over his fleet of machines. We also had a Kiwix (offlineWikipedia), WordNet 3.0( Dictionary) , Kushal Das’s Tutorial . Our Choice of Distro was Fedora 7(Moonshine) and we implemented LTSP4.2u2. It has been quit a while,that we last updated this blog. Today we decided to plan the setup for the computers that we are recieving from wbut. did a little bit of measurement for our ethernet setup. hopefully setup will be completed by this week or the next ,so that we can resume with more power than before. Today was a wonderful day in Bijra,Sunny weather,clear sky,fresh air and last but not the list we encountered a fresh bunch of students. Just being promoted from primary to secondary these students have never seen a Computer before.With request from Nizam Sir,we took a special class of these students. we showed them what different thing a computer can do,from paint to song ,from word processor to edutainment. Guess what ? ?Â Â Â Â Â they are simply” WOW” ed. Here is a pic..
Today after so many days went to Bijra. While nothing has changed in this 2 months except class 10 has forgot everything( very disappointing) ,we found class 9( previously class 8 ) a very good class which if moulded can been taken above limits. Today did some interactive study using Kbruch,kolorpaint and Xmms.